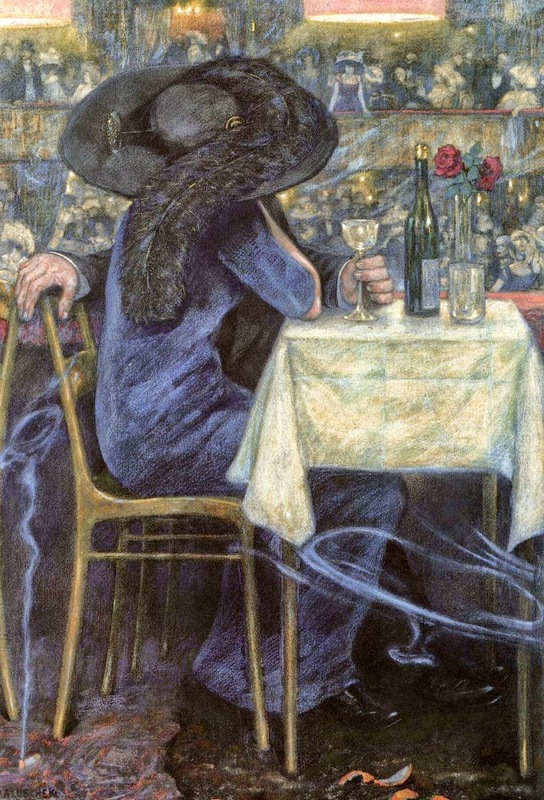 Hans Baluschek (1870-1935) was a German painter, graphic artist and writer. 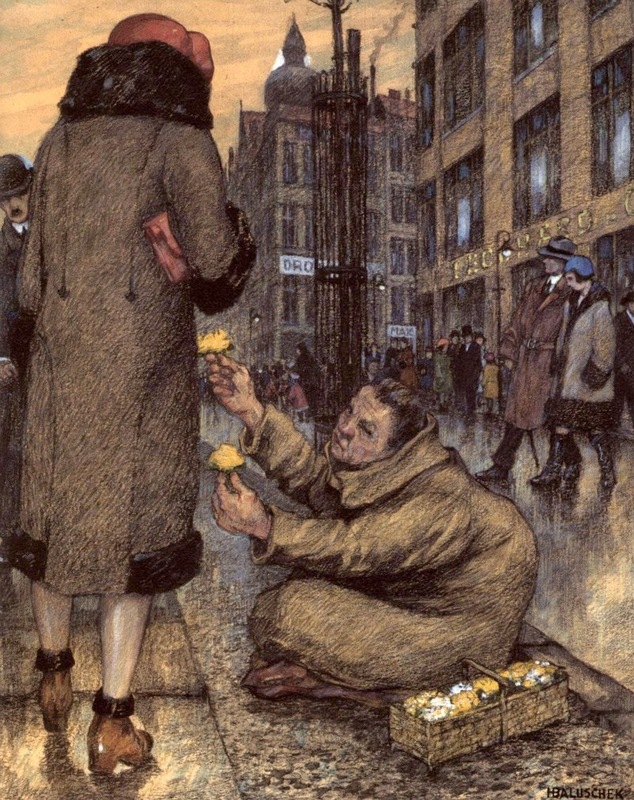 Baluschek was a prominent representative of German Critical Realism, and as such he sought to portray the life of the common people with vivid frankness. 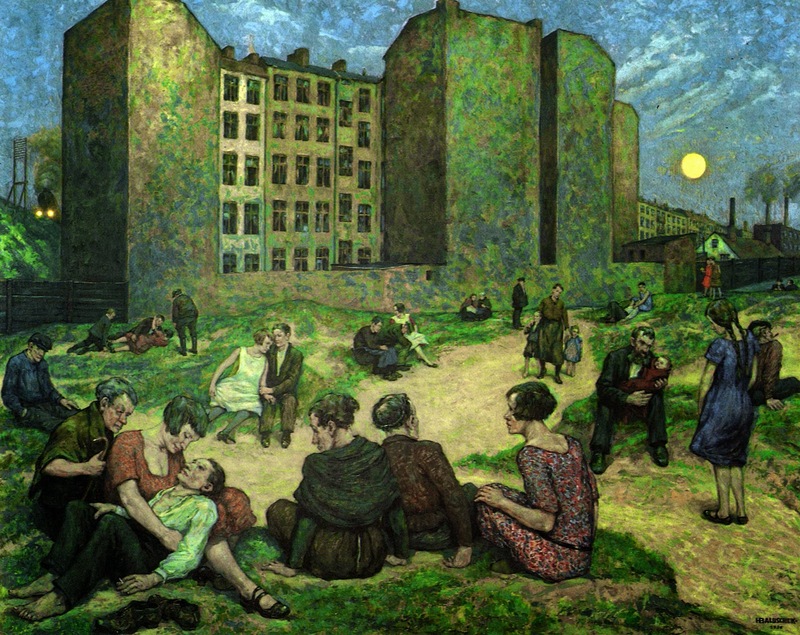 His paintings centered on the working class of Berlin. 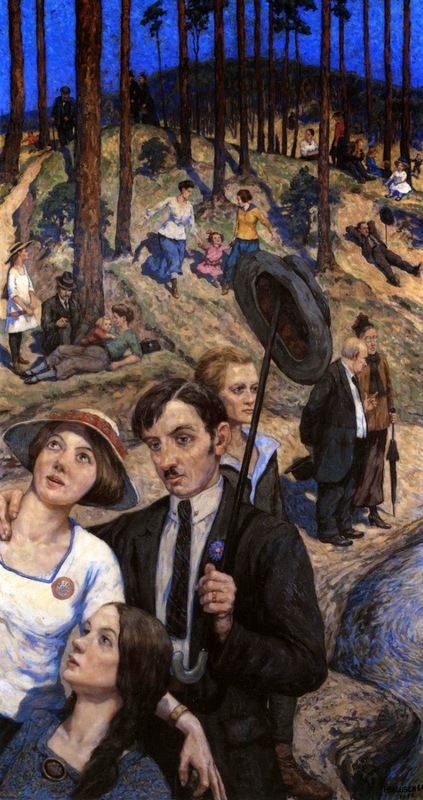 He belonged to the Berlin Secession movement, a group of artists interested in modern developments in art. 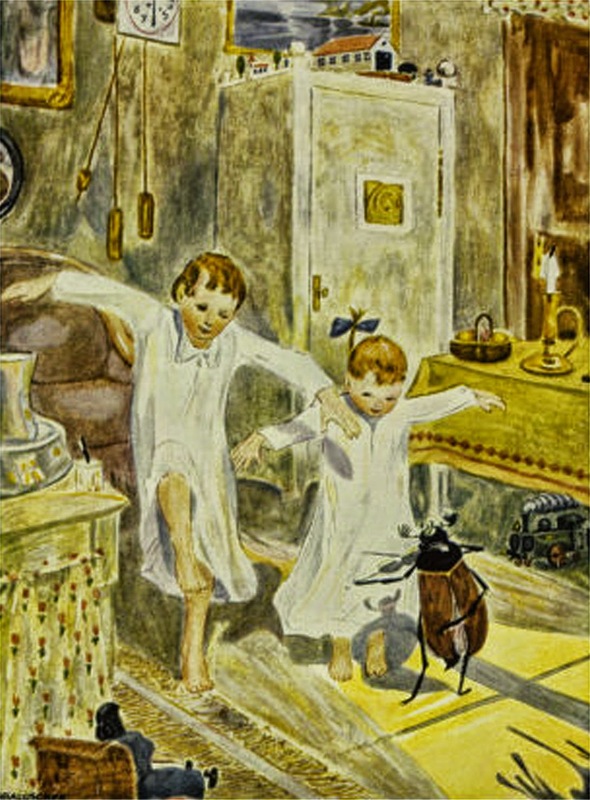 Yet during his lifetime he was most widely known for his fanciful illustrations of the popular children's book Little Peter's Journey to the Moon (German title: Peterchens Mondfahrt). 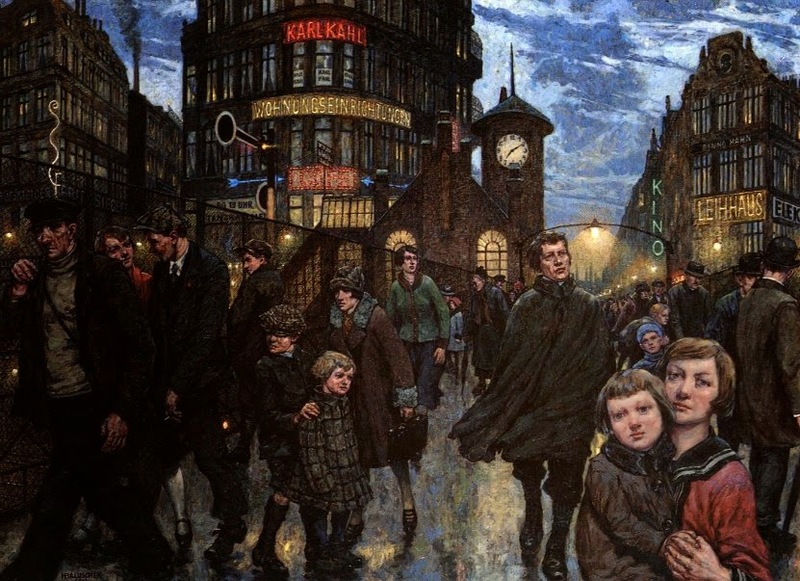 Hans Baluschek after 1920 was an active member of the Social Democratic Party of Germany, which at the time still professed a Marxist view of history. 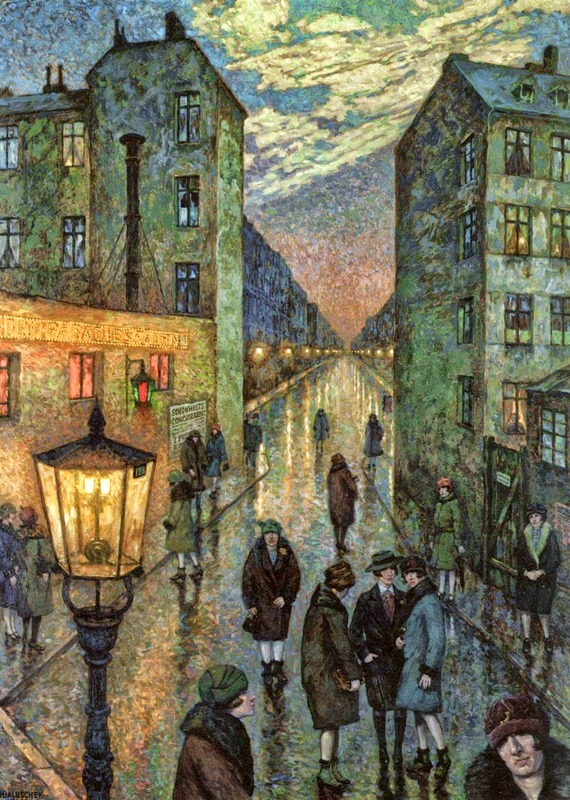 Hans Baluschek was born on 9 May 1870 in Breslau, then Germany's sixth-largest city (now Wrocław, Poland), to Franz Baluschek, a surveyor and railroad engineer and his wife. He had three sisters, two of whom died of tuberculosis in childhood. After the Franco-Prussian War and foundation of the German Empire in 1871, Franz became an independent engineer of railways, and lived for a time in the much smaller town of Haynau (now Chojnów, Poland). 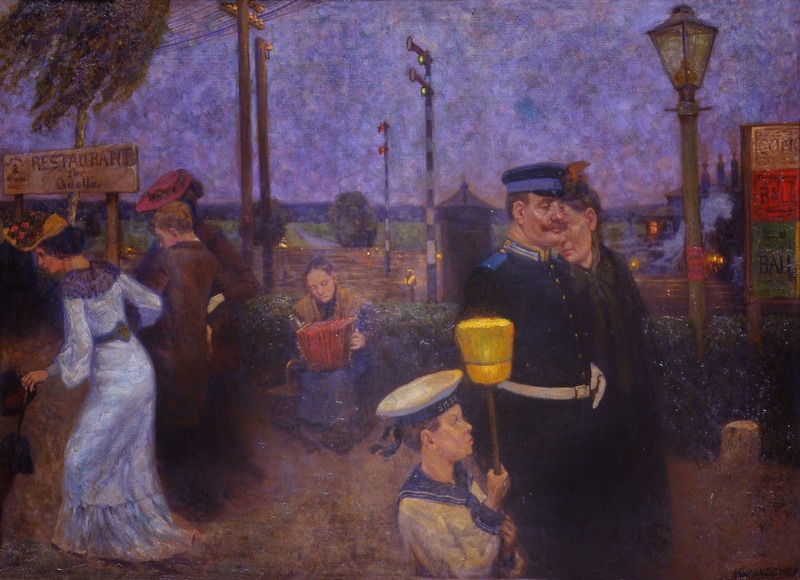 It was during his childhood Hans Baluschek developed a fascination with railroads that later would be shown in his paintings. 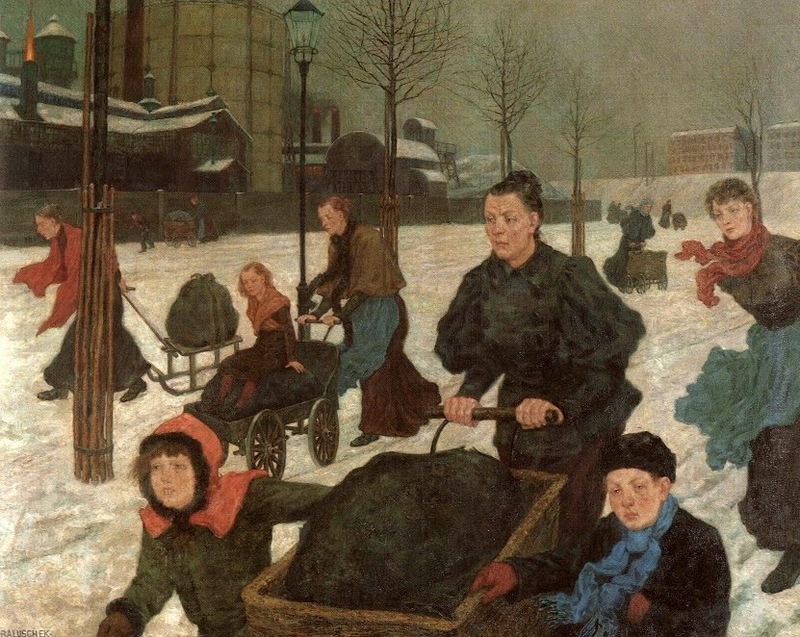 In 1876 the family, with 6-year-old Hans, moved to Berlin, where during the next decade they changed their residence no less than five times, living in a succession of newly built apartments developed expressly for workers. 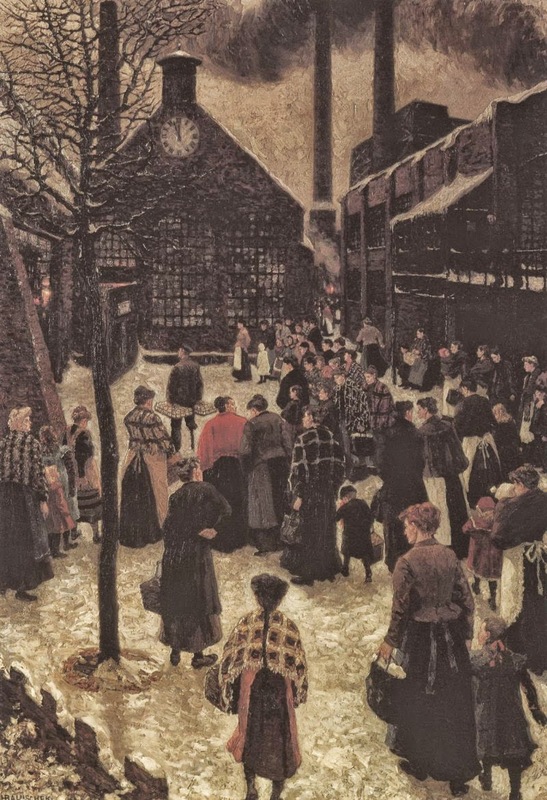 Berlin found itself in the midst of an economic crisis following the Panic of 1873, but Franz Baluschek was fortunate in maintaining railroad employment and was able to support his family in kleinbürgerlich (petite bourgeois) style amid the family's less affluent proletarian neighbors. 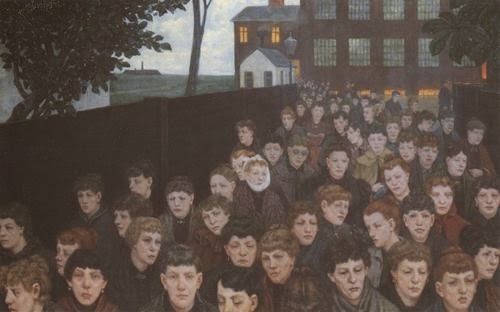 Following primary school, Hans Baluschek at age 9 entered the Askanische Gymnasium, a secondary school in the Tempelhof-Schöneberg district of Berlin, which offered curricula in the humanities and natural sciences. 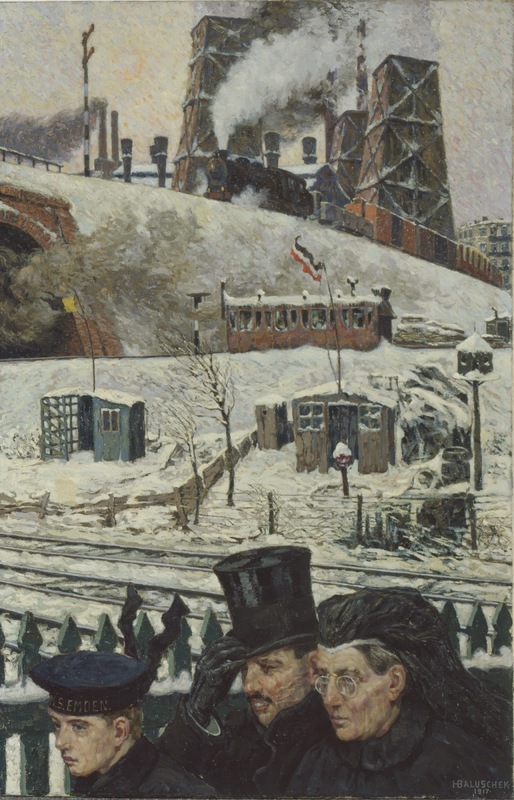 During the 1880s, young Baluschek was profoundly impressed by a Berlin exhibition of paintings by Russian artist Vasily Vereshchagin, whose works portrayed the horrors of war, particularly the Russo-Turkish War of 1877-78. They were widely debated in Berlin artistic circles, where their graphic realism came as a shock to some. 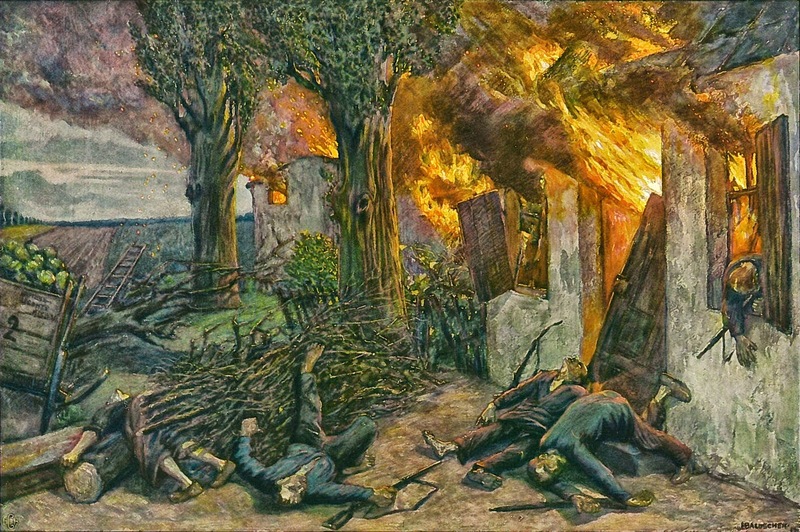 Baluschek began to copy pictures and to paint his own war scenes in the manner of Vereshchagin, whose influence may be detected in some of Baluschek's later works. In 1887, his father took a job with the railroad on the large German island of Rügen, and the family moved to nearby Stralsund, where Baluschek completed his Gymnasium education. In Stralsund he was influenced by instructor Max Schütte, who taught his students the principles of socialism, particularly emphasizing the relationship of economic and social issues - and who was ultimately fired because of his left-wing political views. Baluschek and his classmates devoted themselves to studying the then-popular political works of Tolstoy and Zola. 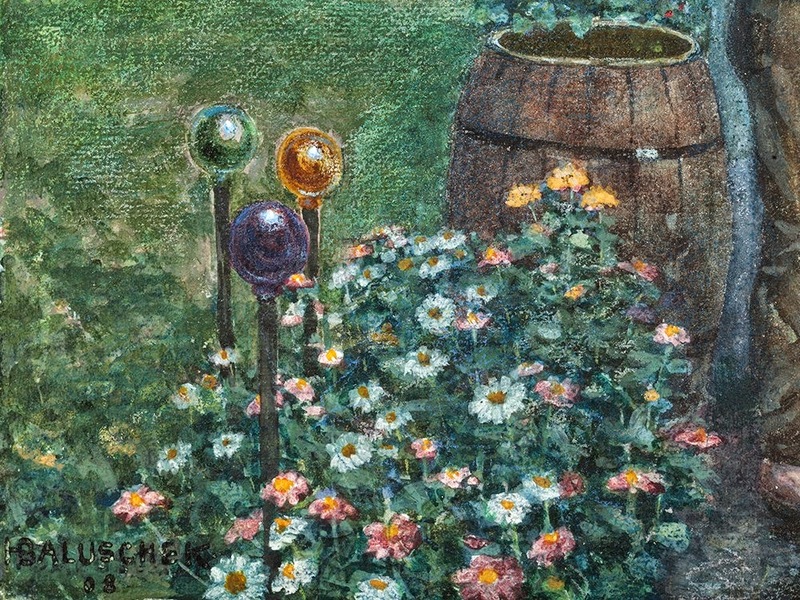 When Baluschek passed his Abitur (school-leaving exam) in 1889 and graduated from the Gymnasium, he stated that he wished to become a painter. 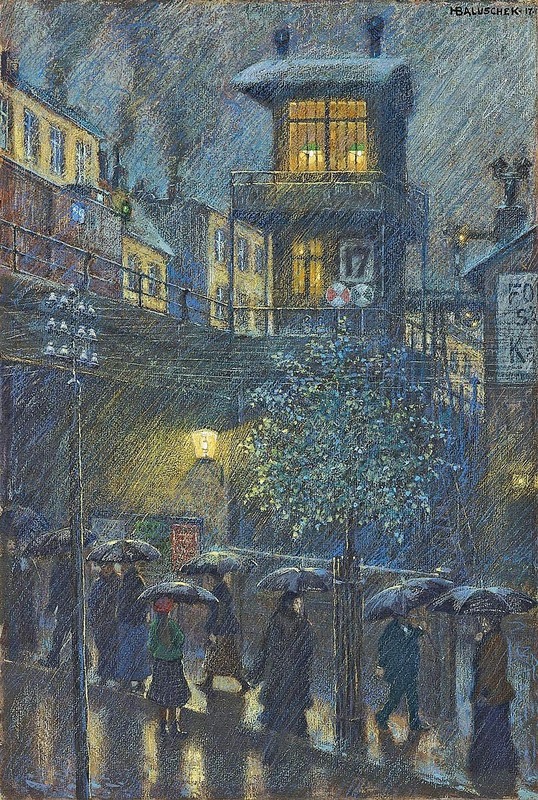 After graduating, Baluschek was admitted to the Berlin University of the Arts (Universität der Künste), where he became acquainted with the German painter Martin Brandenburg, with whom he was to maintain a lifelong friendship. The university, however, remained quite conservative despite many new trends in the arts, such as the widely popular French Impressionism. Instruction focused on traditional techniques and art history. Baluschek lived in the Schöneberg district of Berlin. 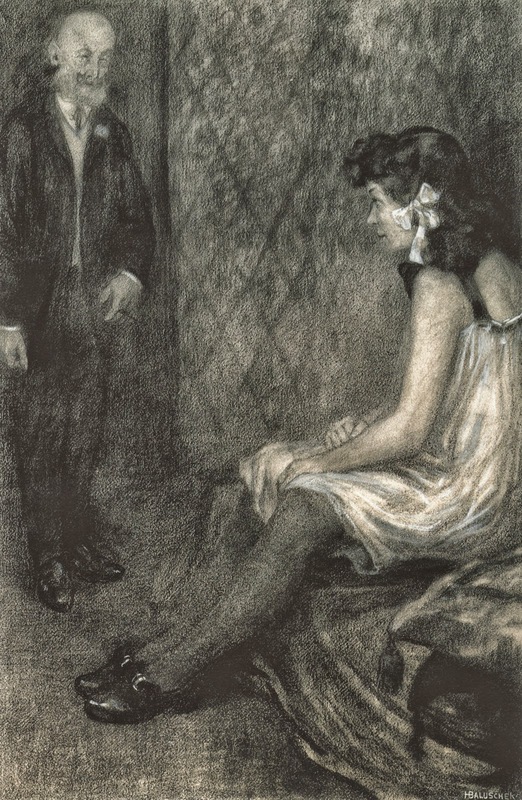 His earliest known sketch book dates from 1889 and includes a self-portrait showing him in student dress. 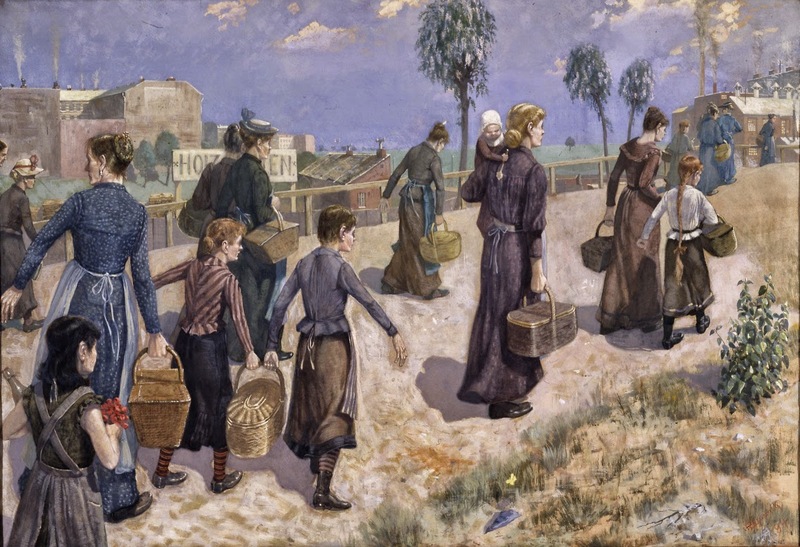 Among his early works are military and war scenes, along with portrayals of street life in Stralsund and Berlin. 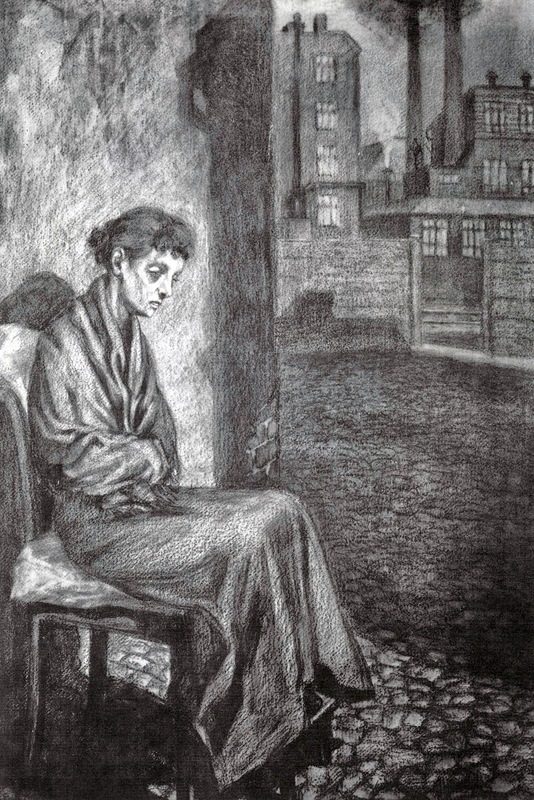 In the 1890s he produced illustrations of class differences and proletarian life in Berlin, in which he finally departed from traditional techniques. 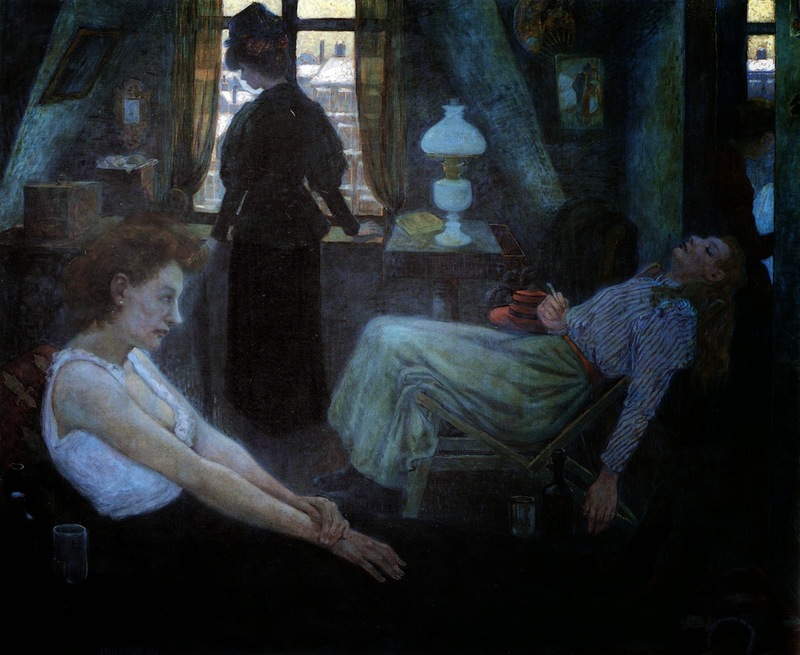 Baluschek left the arts university in 1893 and began to work as an independent artist, now focusing almost exclusively on social-class differences - which made him an outsider in the conservative arts scene of Wilhelmine Germany. Meanwhile he was reading the left-leaning works of Gerhart Hauptmann, Tolstoy, Ibsen, Johannes Schlaf und Arno Holz and was heavily influenced by the literature of Naturalism. 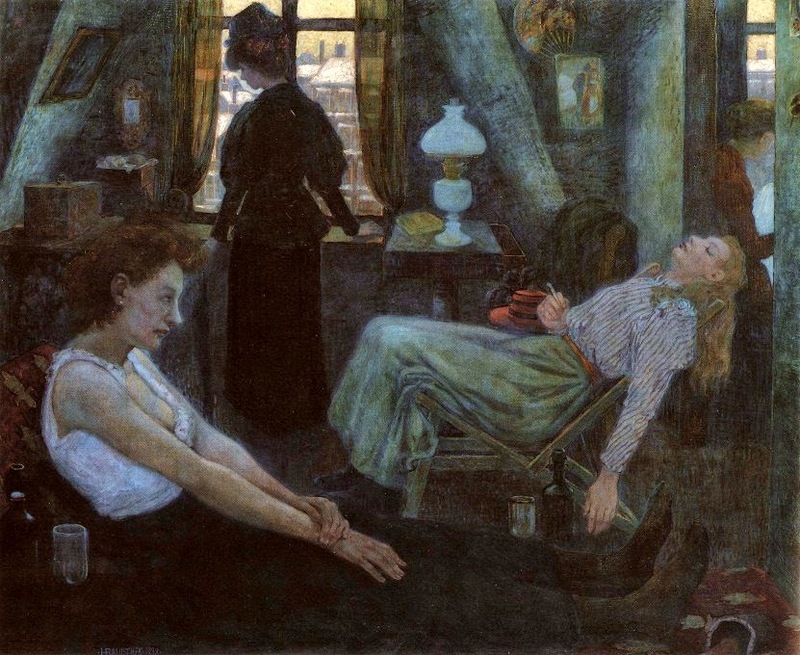 The main period of Bakluschek's artistic development began in 1894 and extended for two decades, until the beginning of World War I in 1914. 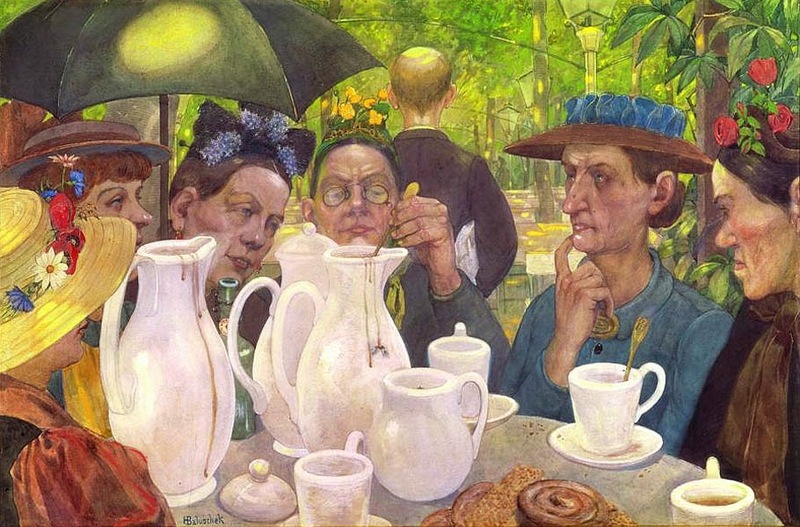 Baluschek identified with opposition to traditional representative art and forged relationships with artists in the circle dominated by impressionist Max Liebermann (later classified by the Nazis as a practitioner of "degenerate art"). 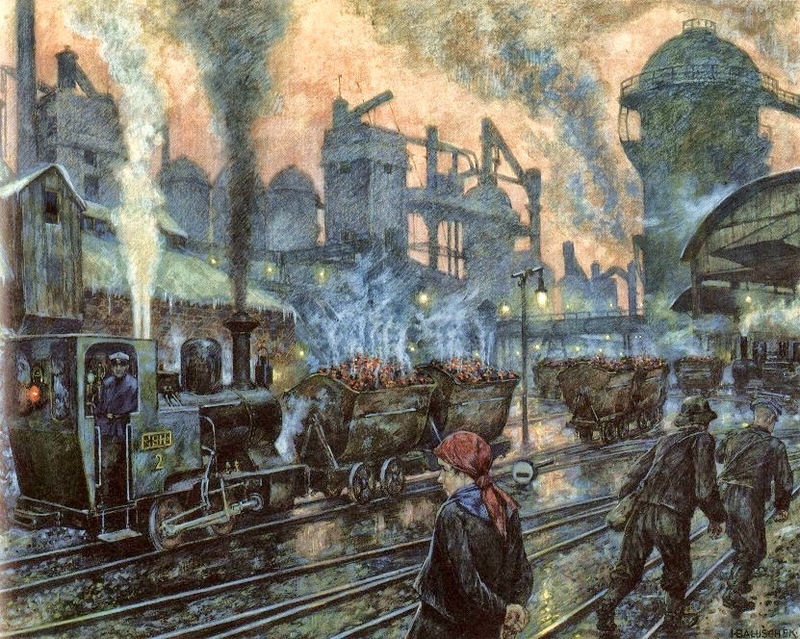 Baluschek's paintings from this period show life on the outskirts of Berlin, where construction of factories, apartment complexes and railroads was booming. 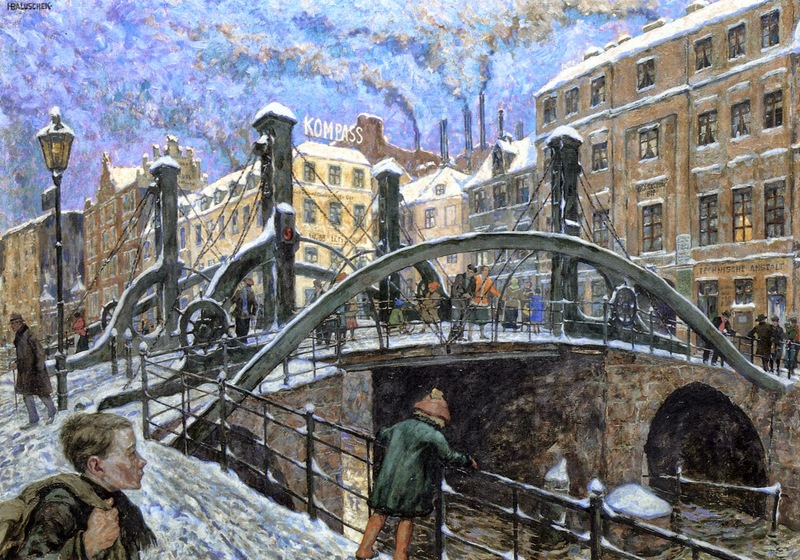 His favorite themes included factories, cemeteries and above all the common working people of Berlin. 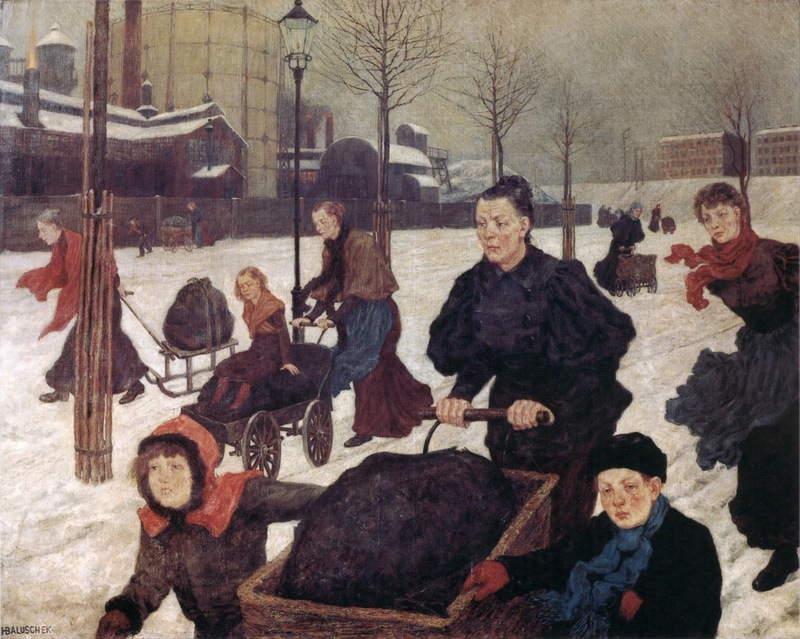 For example, his 1894 work Noon (Mittag) depicts women with children bringing lunch baskets to their men employed at the factories, and evokes the "endless drudgery" of working-class life, with its constant repetition of daily tasks. 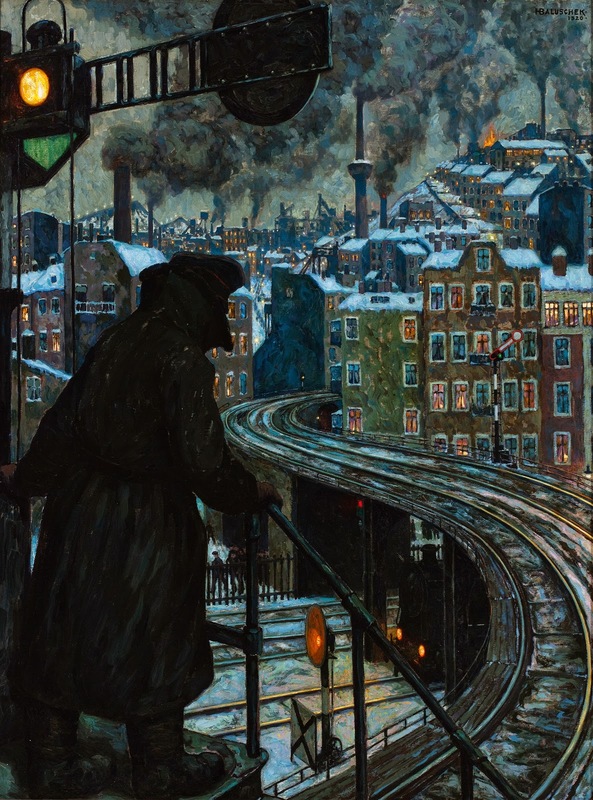 With Railwayman's Evening Free (Eisenbahner-Feierabend) in 1895, this theme is represented by an individual worker who returns exhausted from work against a backdrop of railroad installations, smoke stacks and overhead tram wires, and is greeted by anxious children. At the time Baluschek maintained a friendly relationship with the avant-garde poet Richard Dehmel, known for poems such as The Working Man (Der Arbeitmann) and Fourth Class (Vierter Klasse). 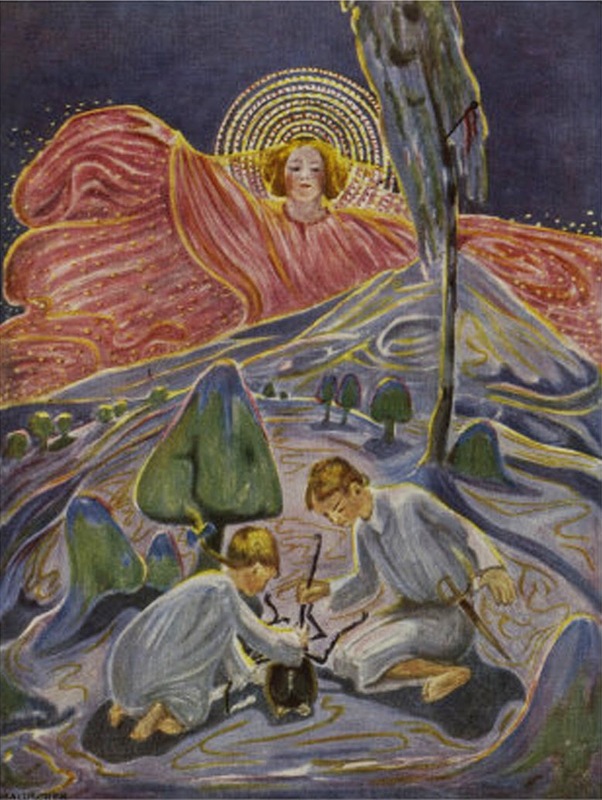 Baluschek produced a cover illustration for Dehmel's Woman and the World (Weib und Welt), a collection of poems that appeared in 1896. Baluschek developed relationships with several left-leaning writers, among them the poet and playwright Arno Holz, best known for Phantasus (1898), a poetry collection describing the starving artists of the Wedding district of Berlin. Holz was for Baluscheck a key figure of literary naturalism and a spiritual mentor. 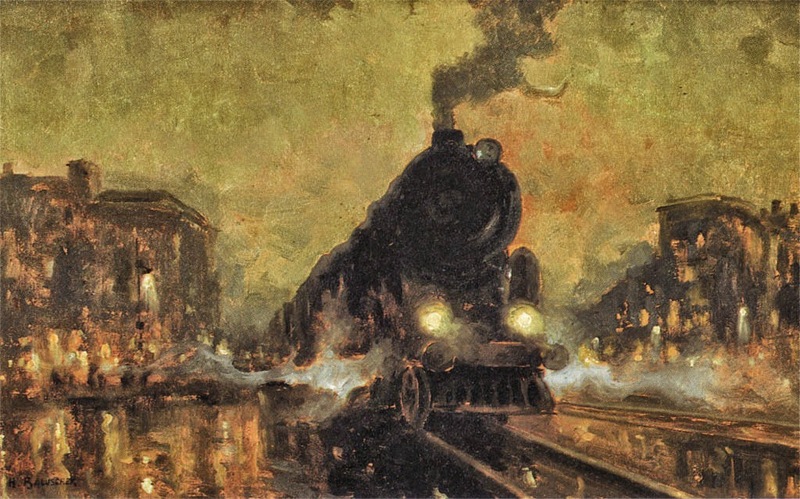 About this time, Baluschek developed his own painting style, using watercolor and gouache techniques; he seldom painted in oils. 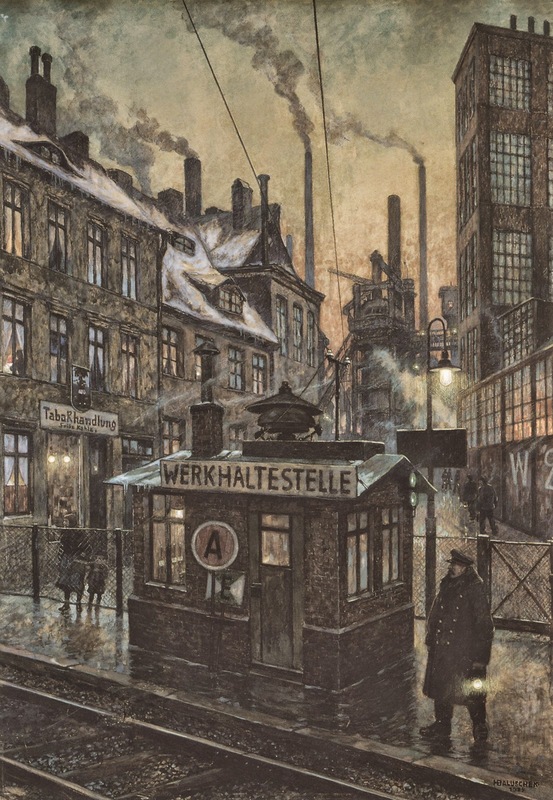 The surface was first prepared with oil-chalk pencil, which Baluschek believed was particularly receptive to the gray urban tones of working-class Berlin. 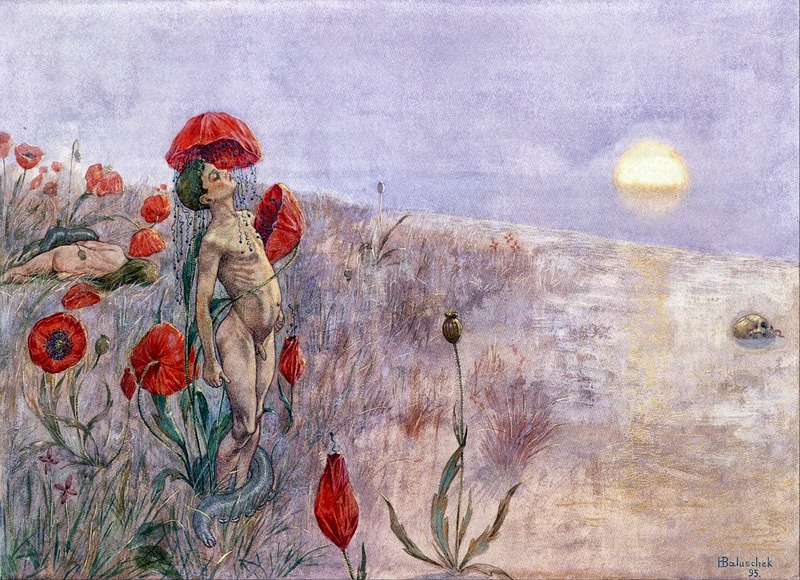 In the second half of the 1890s Baluschek progressively gained recognition in the Berlin arts scene, especially after exhibitions in 1895-1897 with Martin Brandenburg. 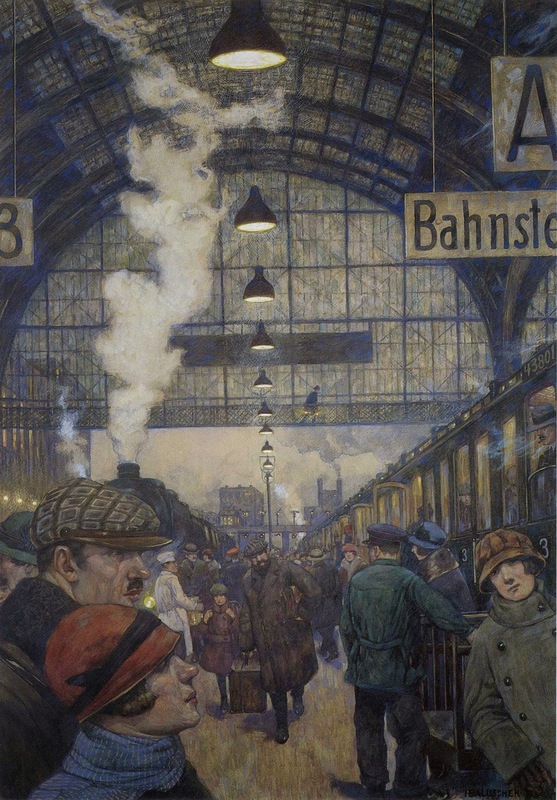 Although Baluschek had been shown earlier in small galleries, these were his first exposure to a larger public. 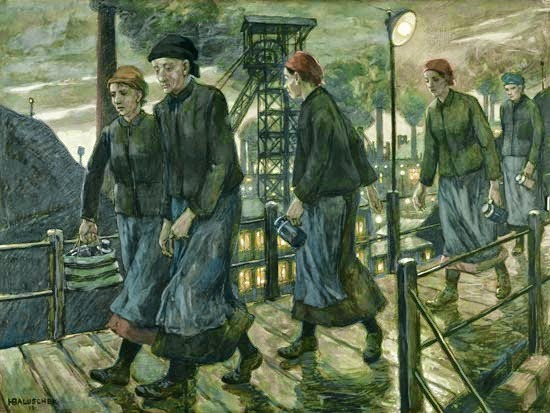 While Liebermann and other artists had painted proletarian themes, Baluschek's work now was seen as new and unusual. 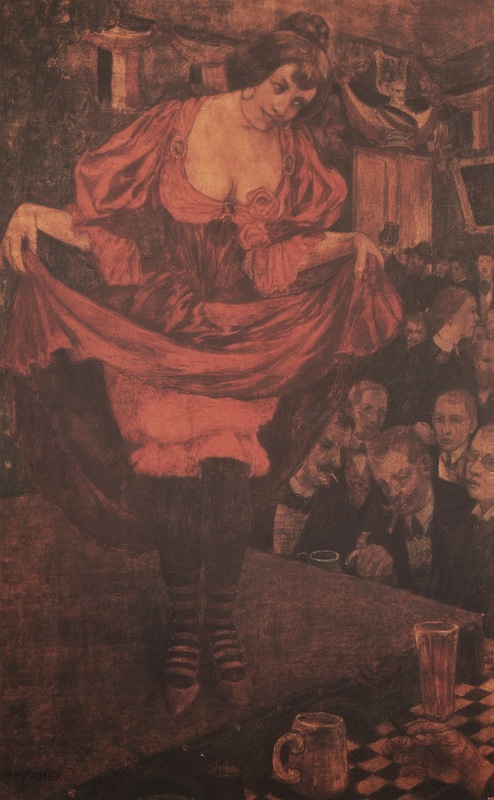 The Berlin art collector Karl Bröhan noted that the "direct honesty" of Baluschek's "slices of life" were "disturbingly provocative". 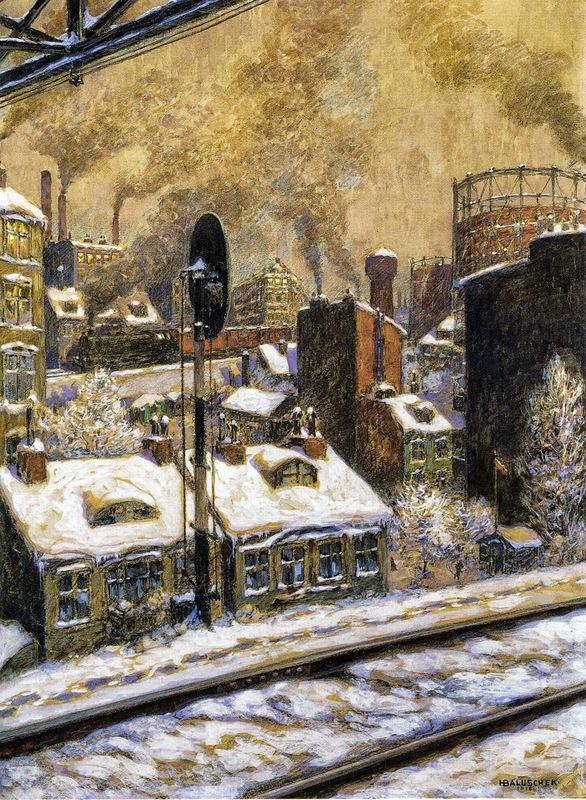 His portrayal of the inhumane living environment and bleak working conditions behind society's often glitzy facade showed, said art critic Willy Pastor, "that more was hidden behind the scenes than a cozy story". At these exhibitions, art critics wandered with amazement from picture to picture, which some of them found lacking in taste and refinement. 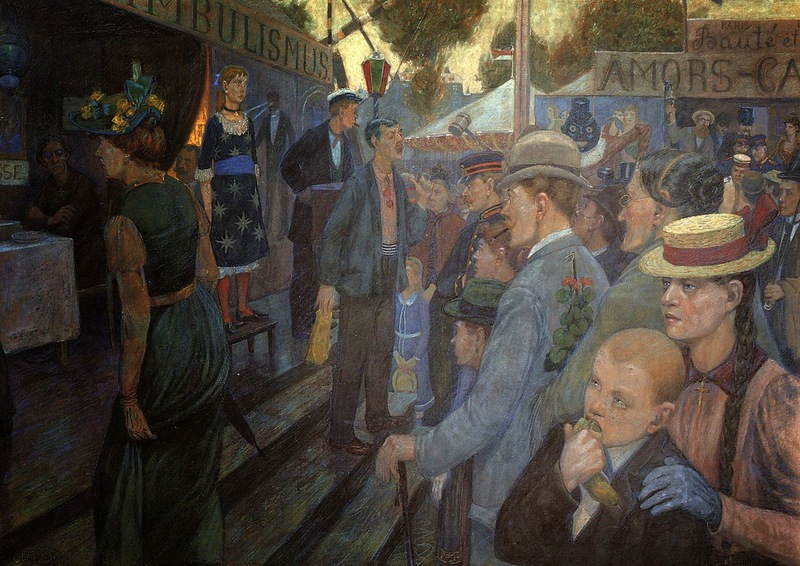 In such works as Hasenheide Amusement Park 1895, a superficial holiday mood contrasts with the sour expressions of the supposed merrymakers. 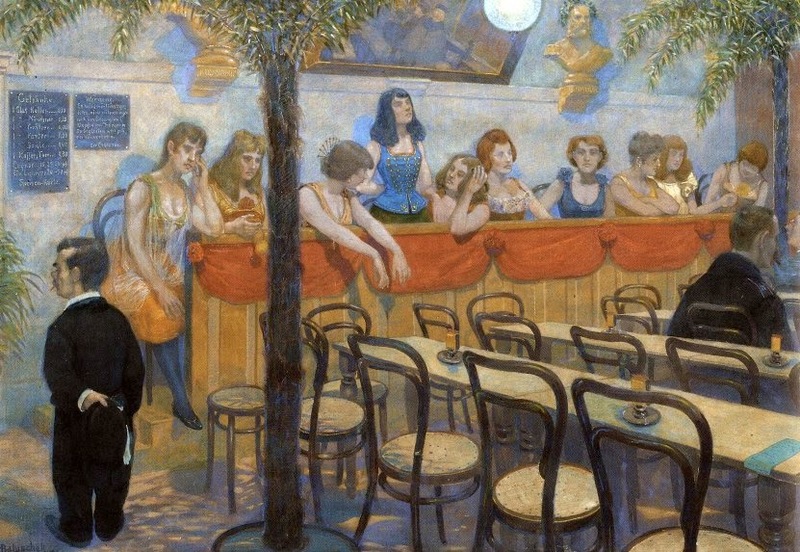 In Here a family can make coffee 1895, the worn and lined faces of the women evoke a similar mood, while in Tingle-tangle (1890), the patriotically decorated interior of a nightspot contrasts with a risqué performance by a prostitute. 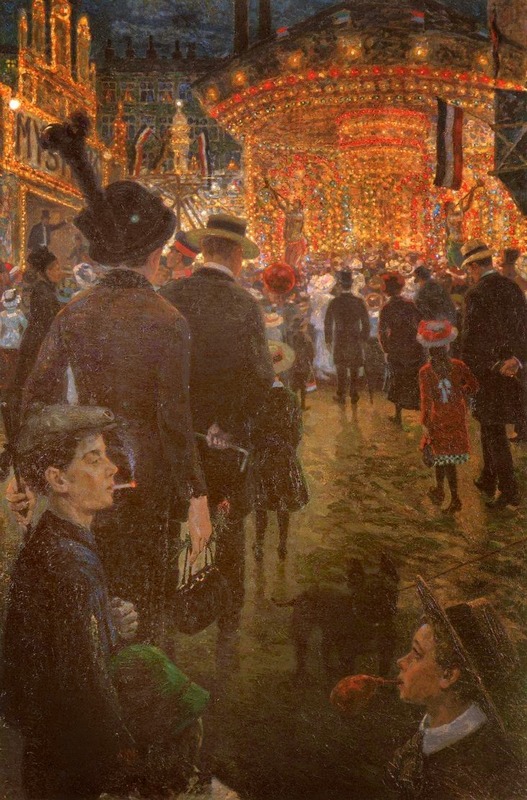 In Berlin Amusement Park, a cigarette-smoking adolescent worker contrasts with a child blowing up a balloon, and the watercolor New Houses (1895) depicts monotonous rows of empty new tenements near a factory. 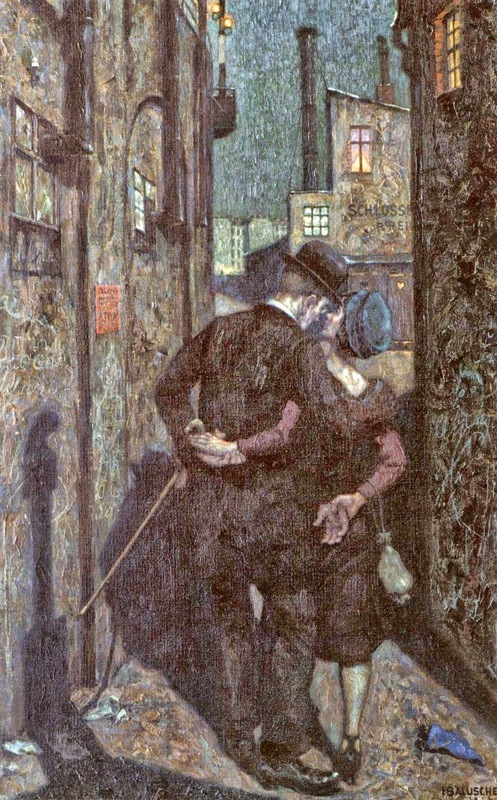 At the end of the 19th century the Berlin art scene split into two camps due to the dissatisfaction of innovative artists with officially sanctioned exhibits in the city's museums. 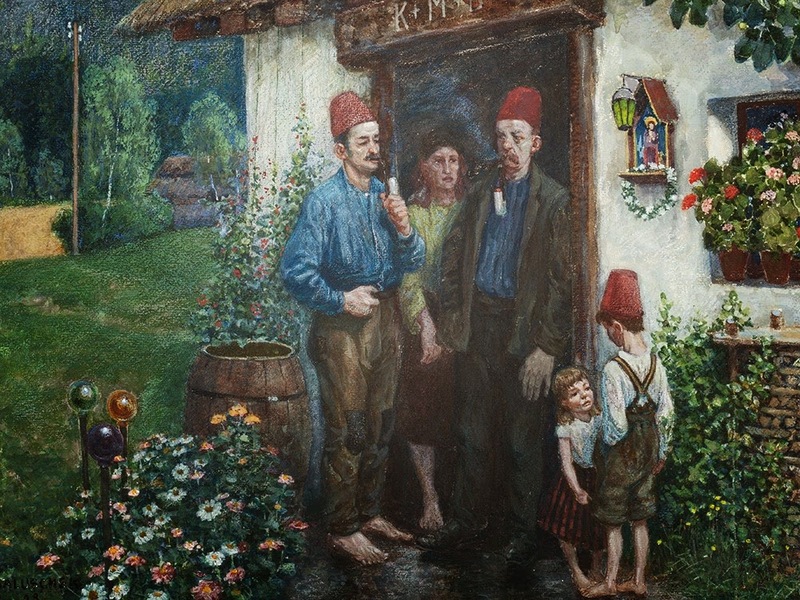 Under the leadership of impressionist Walter Leistikow, "The XI" art group was established in 1892, and Baluschek was invited to participate in XI exhibits. In 1898 many members of XI, also led by Leistikow, formed the Berlin Secession - among them Baluschek, who became the group's secretary. The Secession also enlisted German artists Käthe Kollwitz, Otto Nagel and Heinrich Zille, and championed French impressionism, Pointillism and Symbolism. 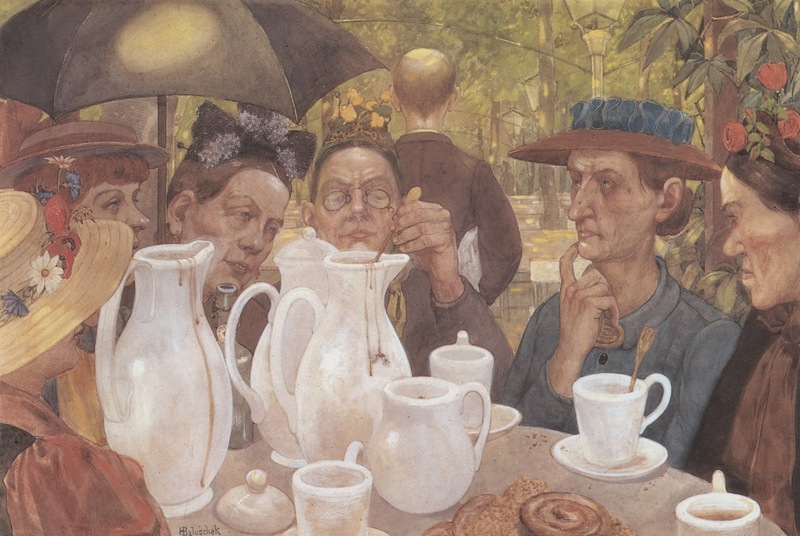 Baluschek regularly debuted his work in Secession exhibitions, becoming a foil for conservative critics. 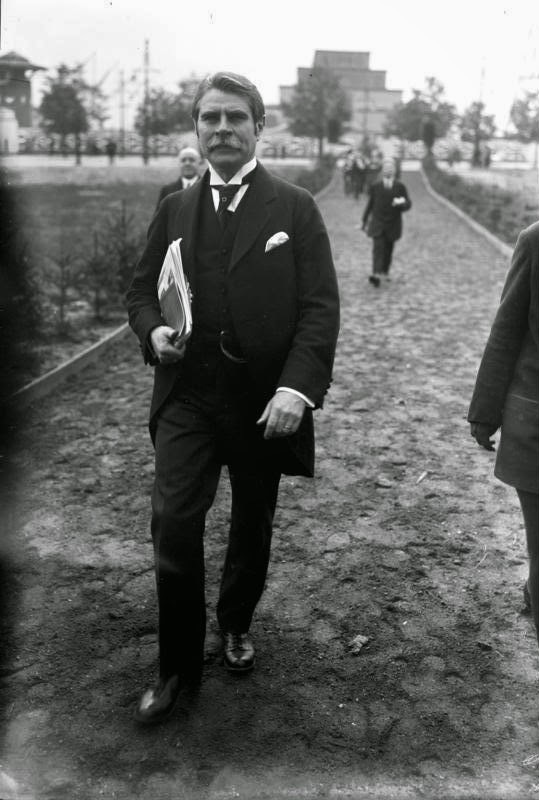 For example, Waldemar Count von Oriola, a Reichstag deputy from the National Liberal Party, termed his work a "rampant travesty of aesthetic norms". In 1900 Baluschek fell in love with stage actress Charlotte von Pazatka-Lipinsky. 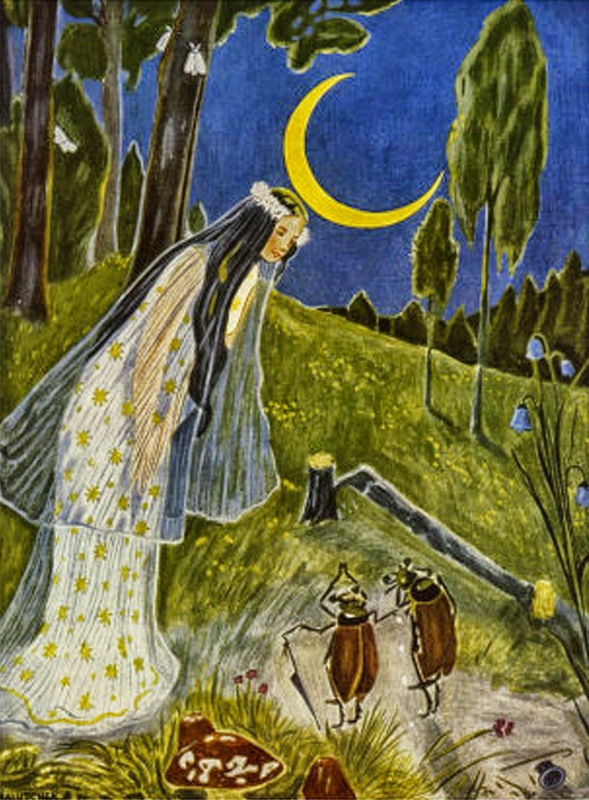 He painted an artistic declaration of love for her in the form of a fairytale picture, in which he appeared as an elf giving a rose to a lady resembling Pzatka-Lipinsky. They were married in 1902 and moved into a house in the Tiergarten district of Berlin. However, their initially romantic marriage proved childless and personally unsatisfying, and they were divorced in 1913. 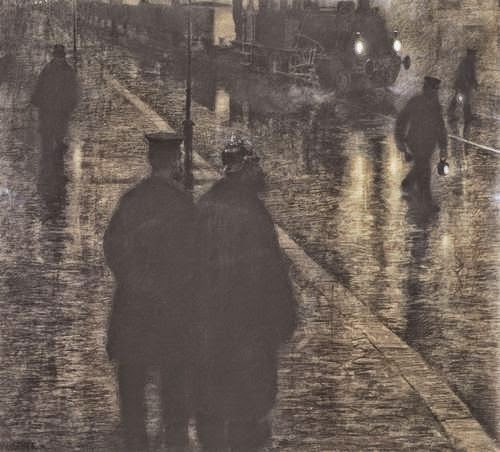 Baluschek was profiled in 1904 as the first in a monograph series by Hermann Esswein titled Modern Illustrators, which later included Edvard Munch, Toulouse-Lautrec and Aubrey Beardsley. 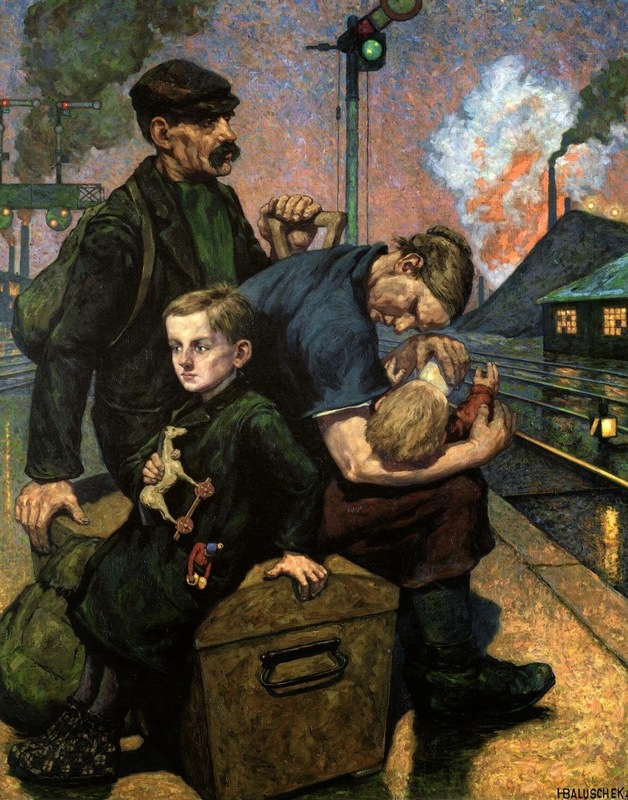 Esswein highlighted not only Baluschek's popular fairytale illustrations, but also his gritty renderings of Berlin working-class life. In 1908 Baluschek became a member of the board of directors of the Berlin Secession, in which capacity he became involved in increasingly contentious debate. The advent of Expressionism led to arguments among Secession members. For example, Max Beckmann complained of "one brazen impudence after another" by the new breed of painters, and Liebermann obstructed a Secession exhibit featuring Henri Matisse. 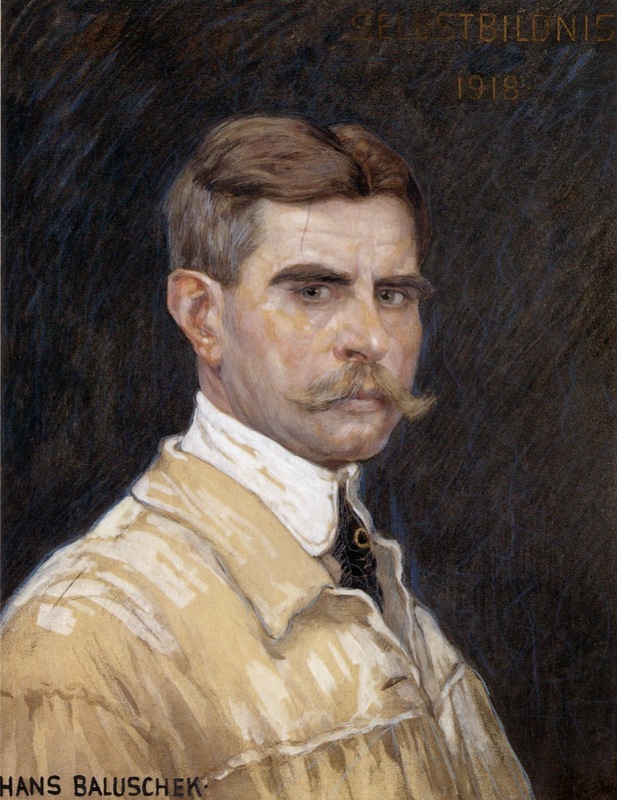 In 1910, a more avant-garde splinter group, the New Secession, led by Georg Tappert and Max Pechstein, staged an "exhibition of works rejected by the Berlin Secession". 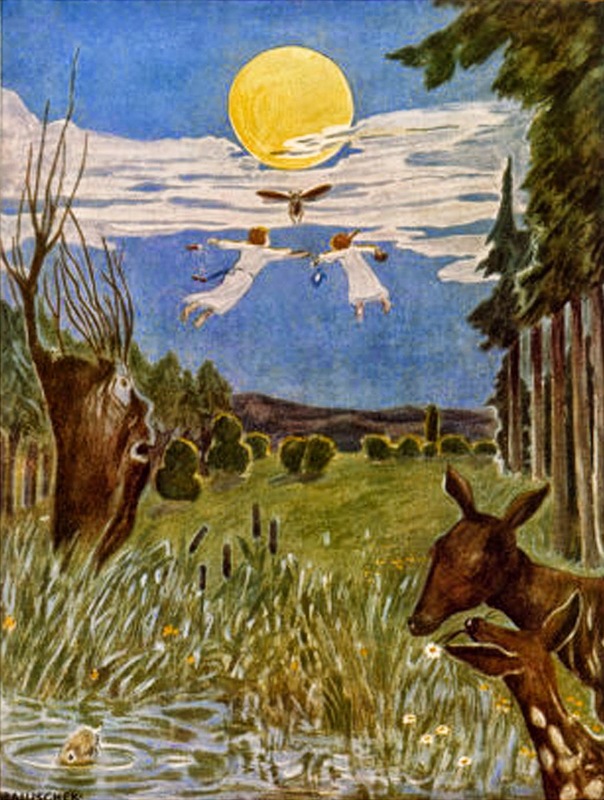 Internal controversy peaked in 1913, precipitating the resignation of 42 artists from the Secession, including the entire board of directors, among them Baluschek. 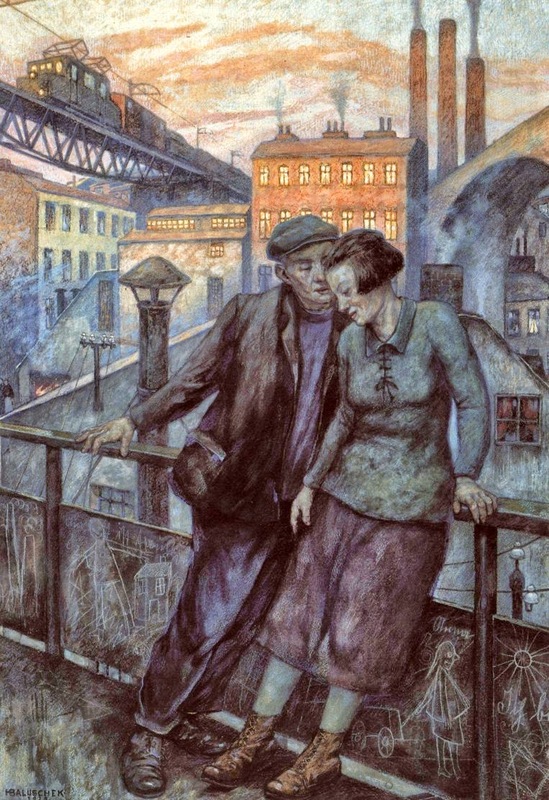 That same year Baluschek, then 43, married Irene Drösse, a 25-year-old former art student. Their marriage endured and during World War I Irene gave birth to two daughters. 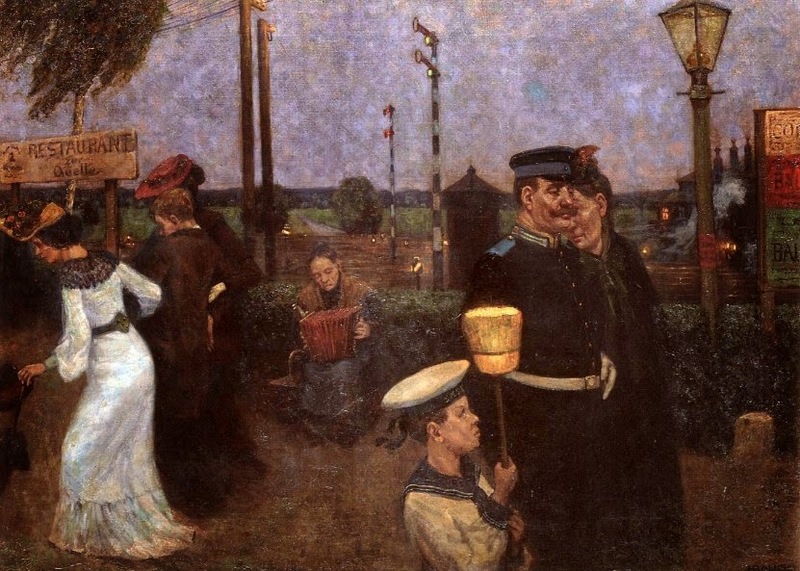 The First World War had a profound influence on the arts scene in Berlin and on individual artists. Germany's declaration of war on Russia and France led to a release of pent-up tensions that had been building for decades due to strained international relations and repeated crises. 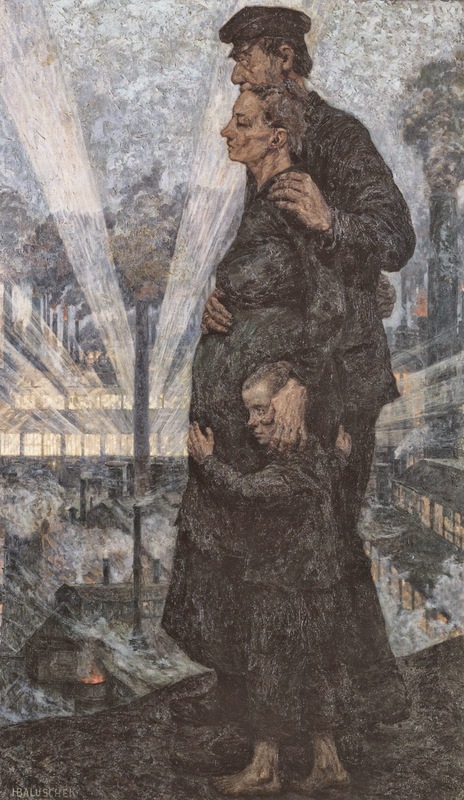 Even in the artistic community there were optimistic patriotic expressions, although a few German artists, such as Kollwitz and Nagel, did not participate in the wave of popular enthusiasm. 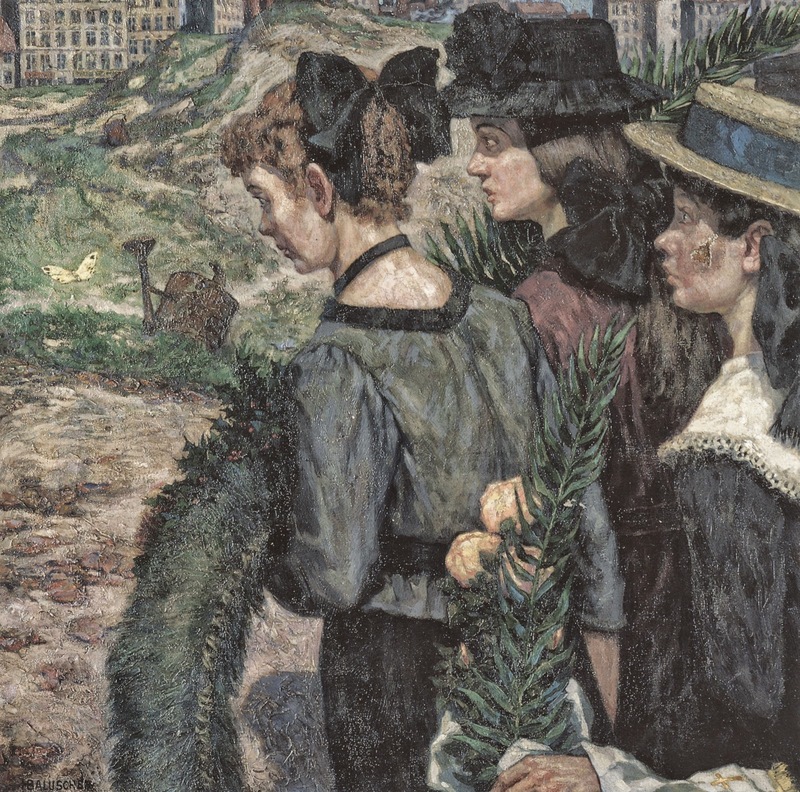 Baluschek and Liebermann were among those who contributed to art critic Paul Cassierer's journal Wartime (Kriegszeit), an attempt to show support for the war effort by the artistic community, and to the weekly publication Artists Journal of the War (Künstlerblätter zum Krieg). Several former Secession members, including Beckmann and Erich Heckel, volunteered for the German Army. 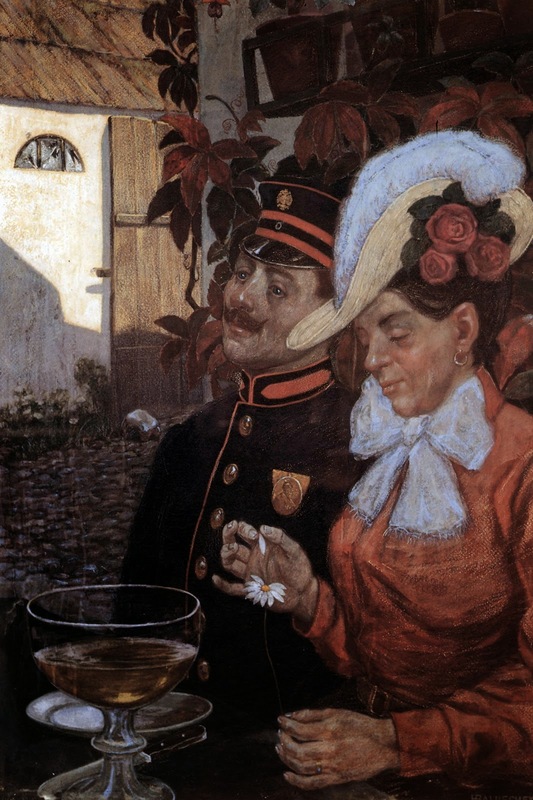 Baluschek's patriotic stance was at odds with his longstanding aversion to the Hohenzollern monarchy, but perhaps reflected an underlying resentment of the pervasive influence of French art in Germany. In 1915, he contributed nearly two dozen drawings to a war map published under the auspices of a hospital association. It included illustrations of modern weapons accompanied by a "glowing patriotic text", and grisly depictions of battle scenes and field hospitals. Although in his 40s, Baluschek volunteered for military service, and in 1916 was posted as a reservist first to the Western Front, then to the Eastern Front. 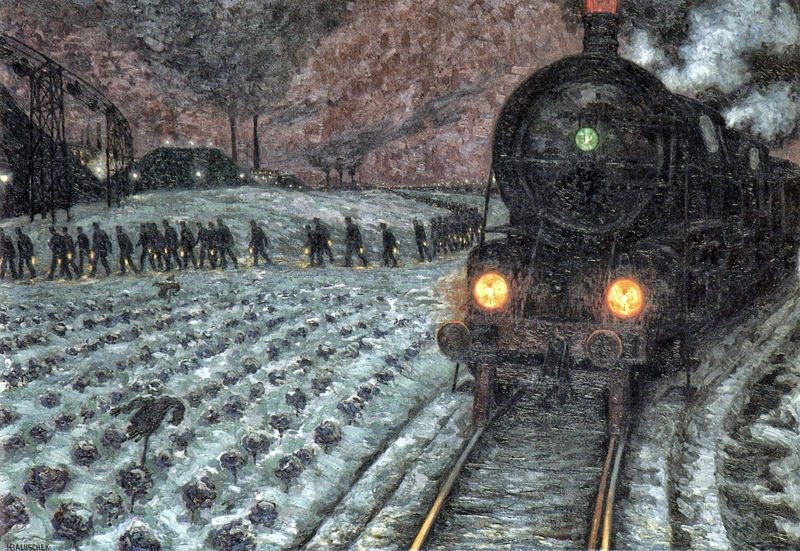 During his hitch in the Army he drafted more solemn depictions of battle scenes. (His close friend Martin Brandenburg, a fellow Secessionist, was severely wounded in the fighting, losing an eye, and was to die from his wounds after the war in 1919). 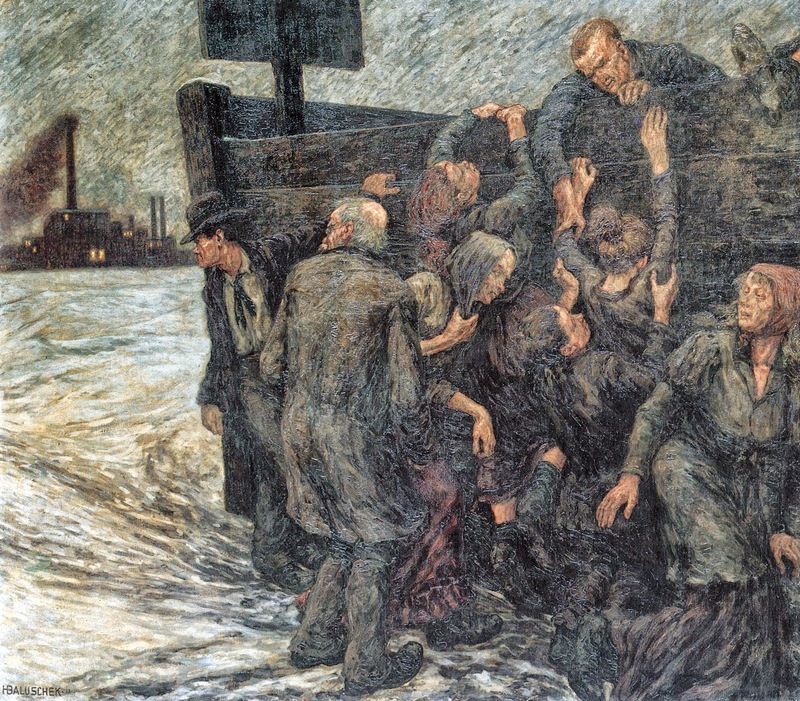 Baluschek's 1917 painting To the Homeland (Zur Heimat) depicts a soldier's coffin bearing medals being loaded for transport to Germany, and evokes the soldier's patriotic sacrifice. 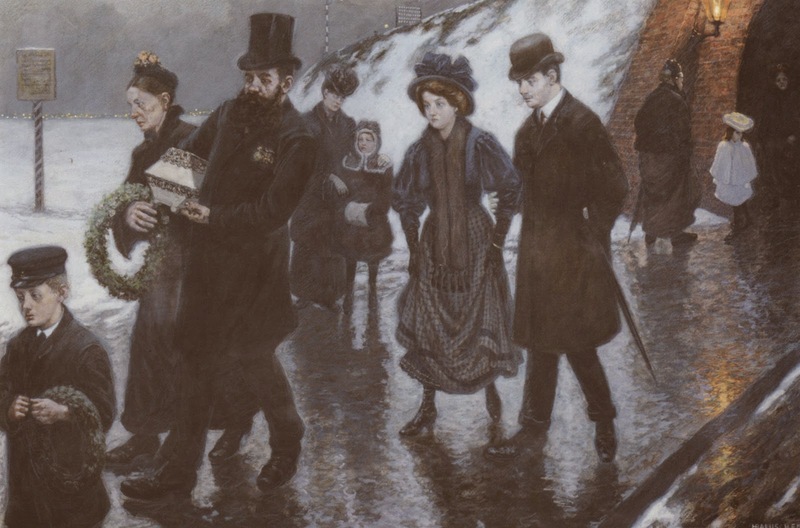 The end of the war in 1918, with its catastrophic outcome for Germany, shook Baluscheck deeply, and he kept his distance from the revolution that spawned the Weimar Republic. His artistic output shrank to a few illustrations and a Self-portrait showing him with a somber expression. 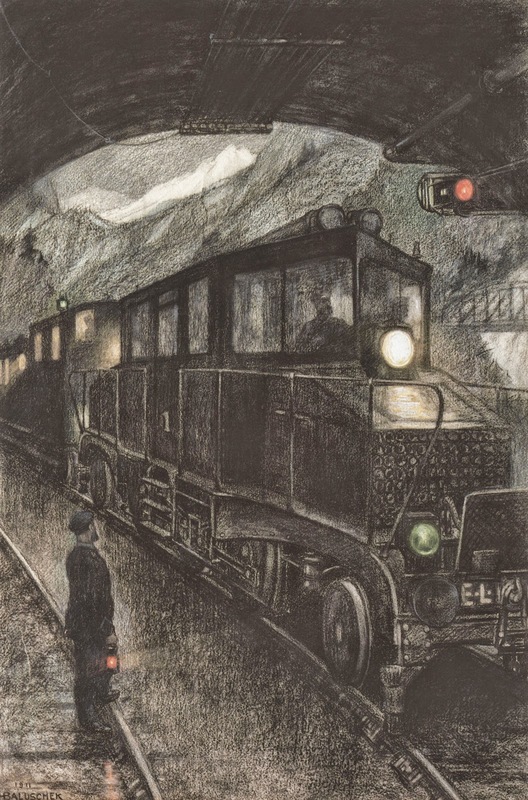 Baluschek illustrated a number of periodicals, including the Social Democratic Illustrated National Banner (Illustrierte Reichsbannerzeitung), and also school books and novels; his fascination with rail transport shows in illustrations from this period. He belonged to the left wing of the Social Democrats, and was comfortable with activities of the Communists, a sizeable political force in Weimar Germany. 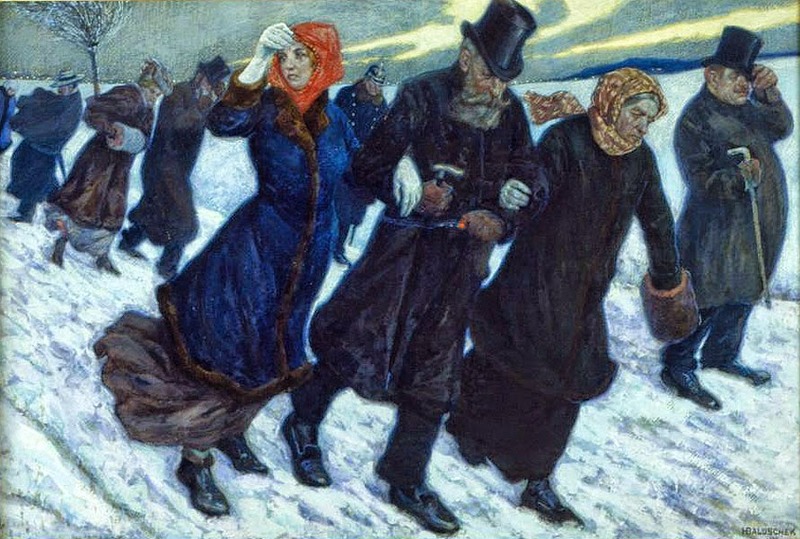 His painting Future (Zukunft) appeared as the title page of the Communist journal Hammer and Sickle in 1920. 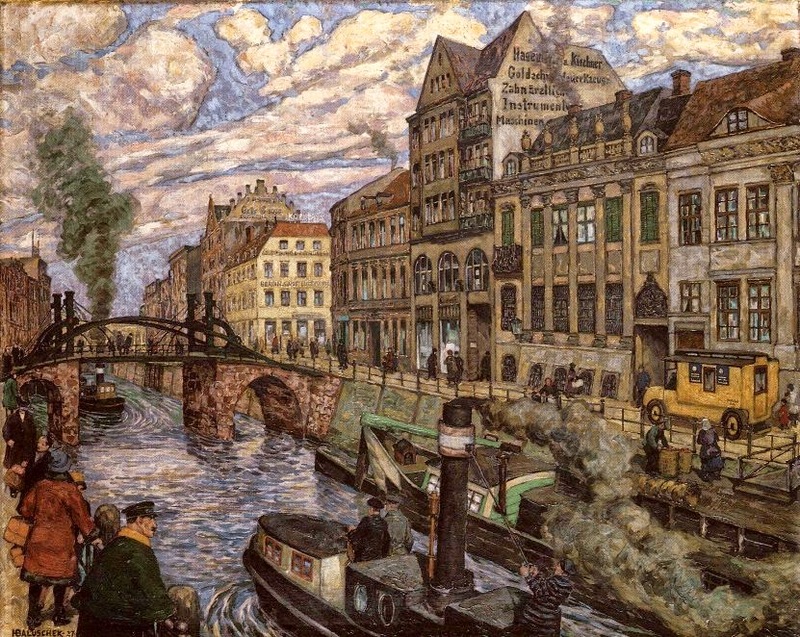 Baluschek was among 10 German left-leaning artists who contributed to a 1924 international antiwar conference in Amsterdam. In 1929-31 he was director of the Greater Berlin Art Exhibition. Predictably, after the Nazis came to power in January 1933 they branded Baluschek a "Marxist artist" and classified his work as so-called degenerate art (Entartete Kunst). He was dismissed from all his posts and banned from exhibiting. 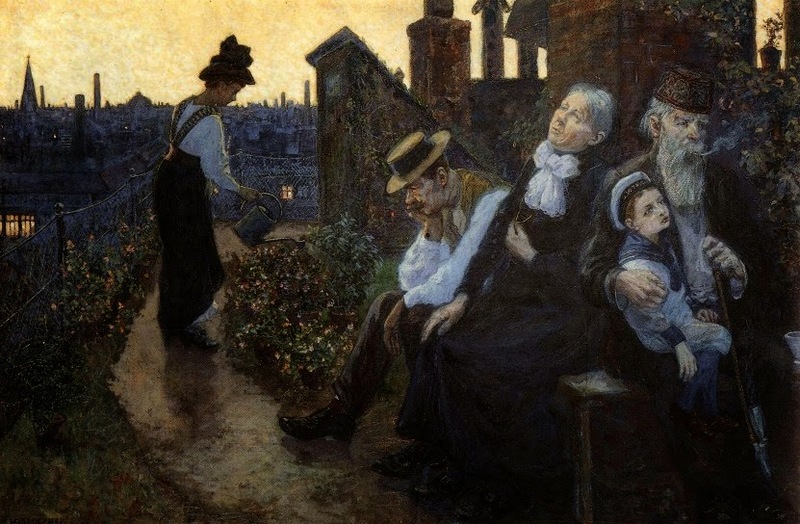 Hans Baluschek died on 28 September 1935 in Berlin, aged 65, and was buried in the Wilmersdorf Forest Cemetery in Stahnsdorf, south of Berlin near Potsdam.